One obvious thing when looking at the Chinese laser is that the table to hold the workpiece is an unnecessary spring loaded contraption that limits what you can work on to 209 X 88mm. Why? 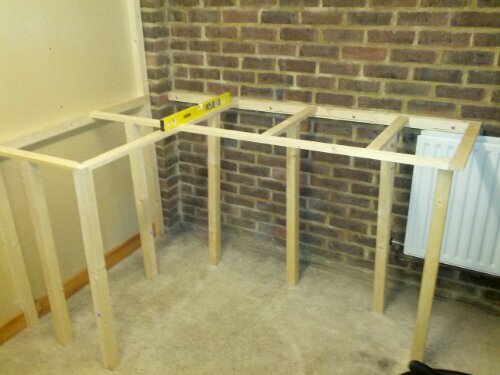 Removing it reveals enough space to add a table measuring 350 X 230mm. It’s easy enough to trim the end stops so that the laser head can cover this area too. 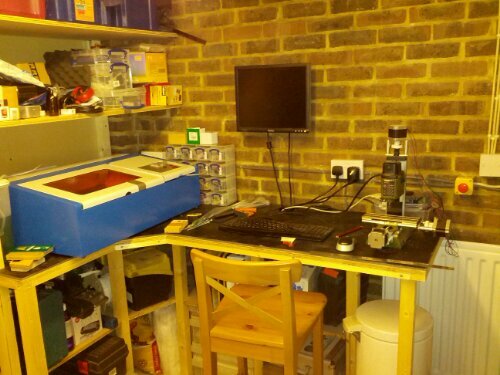 So on to making a more useful lasering area! I started with some 10mm L shaped aluminium, cut some 90 degree notches in it so it could be folded into a rectangle. I made up some corner pieces to hold it in shape. These were initially 3D printed but I ended up CNC milling them from 5mm acrylic instead. The L shaped slot held the aluminium frame firmly and hex cutouts underneath held some M6 nuts. Some coach bolts provided simple height adjustment. 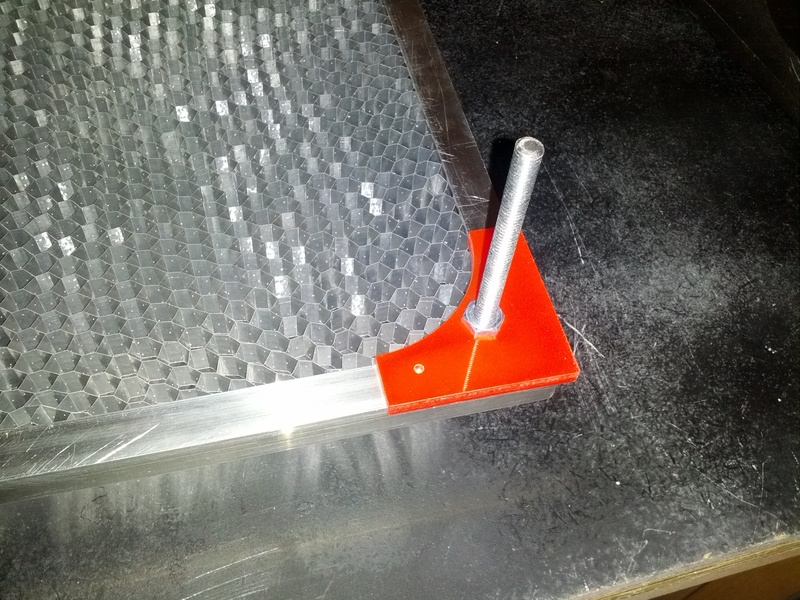 It was all finished off using some aluminium honeycomb (6.4mm cells and 10mm thick) from Easy Composites. In the future this could be motorised, but for now this is all I need to cleanly cut sheet material up to A4 in size. The great thing about the 40W Chinese lasers you can get on eBay is the price. For what you pay, the quality of the core components is surprisingly good. The laser tube and power supply are fine. The optics (mirrors and lens) are fine. It’s really only let down by the quality of the surrounding bits. Wires may be loose. Screws may be missing. Alignment may be off. The table to hold the workpiece is bizarrely small. The Moshidraw software is an abomination. However all this stuff can be change to turn your £500 laser into something you might have to pay 3-4 times the price for. 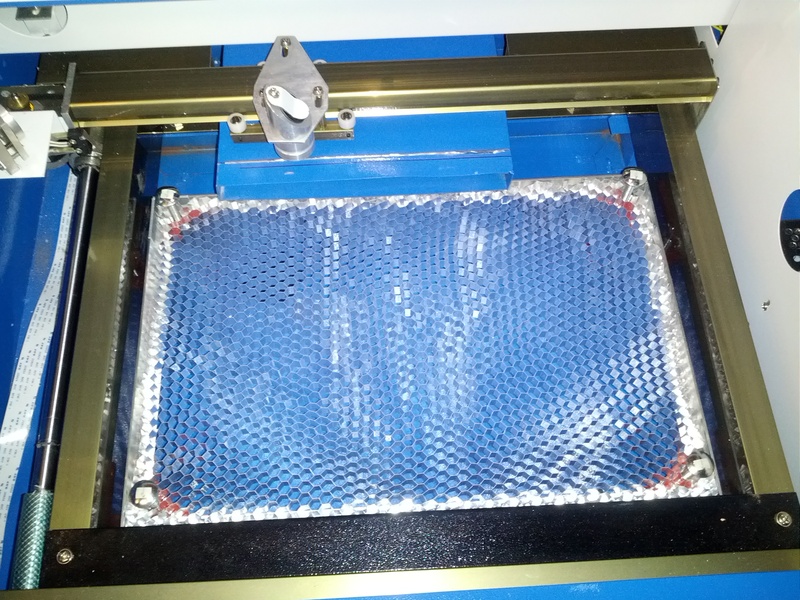 The first improvement to the laser had to be to ditch the Moshidraw controller board and software. I’d heard so many bad things about it that I decided to replace it straight away. I’m proud to say that I’ve never even installed Moshidraw. I replace the board with one from ChrisCircuits. 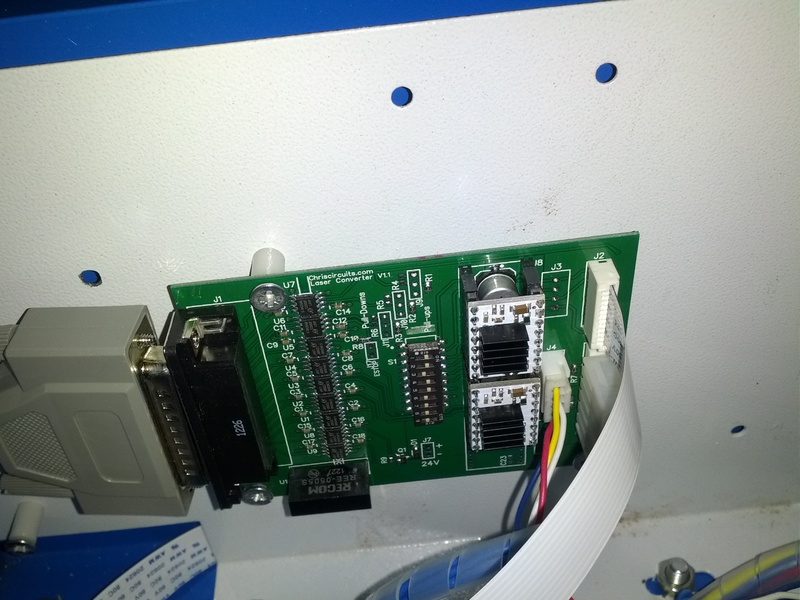 It’s basically a parallel port breakout with a couple of Pololu A4988 stepper drivers. However, Chris has done an excellent job sourcing the unusual connectors and making it a swift drop-in for the Moshiboard. There were a couple of tweak to be made to make his V1.1 board work in place of a V4.1 Moshiboard, but he documented these well and it was easy enough to do. Now I can conrol the laser using CamBam (for design) and Mach3 (for CNC control) and I’m right at home. This is the same toolchain I use with my CNC mill. It wasn’t completely smooth. I was surprised to find a female connector on the board rather than the male on on my TB6560 mill controller. An annoying delay whlist I ordered a male-to-male DB25 cable. I also had to cut out a slot in the side of the machine that was big enough for the cable. The little USB opening wouldn’t cut it. The X axis didn’t work at first but it turned out to be nothing more than a loose cable. I meticulously worked out how many steps per millimetre I needed by meausing the belt pitch, counting the teeth on the pulley and checking the microstep setting on the driver. I calculated it at ??. Way out. By measuring how much travel there was it turned out to be 79. Oh well. 79 it is. No idea why. Anyway, here’s the obligatory “first cuts” video. OK. This bloody laser is trying to kill me. Shortly after getting it I checked it over. It needs some water flowing through it to keep the glass laser tube cool and the tubing was kinked. So I decide to blow through it to ensure the thin flexible rubber tubing wasn’t blocked and the coolant would flow OK. I assume the tubes would be empty so I wasn’t expecting to blast a load of stagnant water out of the tube all over me. Yuck. Oh well. It seemed to work OK so I filled it up with clean water and some antifreeze and continued to test it out. I was pleased to find the tube and PSU in working order. A week later I was struck down with a really dodgy stomach bug. My wife (a GP) checked me over for the usual things but the tests came up negative. I mentioned the stagnant Chinese pond water and she tested for a few more things you wouldn’t normally check for unless you’d been abroad. Bingo! It turns out my bloody laser had given me a nasty water-borne amoeba like gut parasite called giardia. Easily treated once I knew what it was but I felt shocking for a week. Later on I was looking to fit a new Z table and wanted to measure how close the beam got to a bracket. I know! 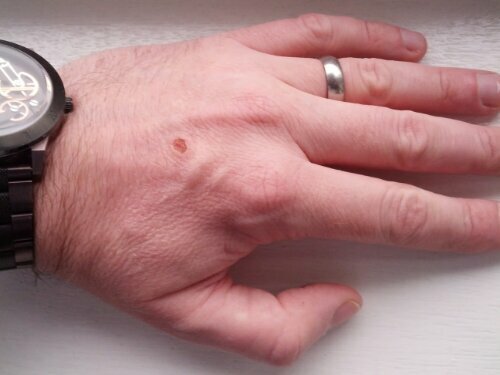 I’ll hold a piece of wood in place and quickly zap the laser to see where the burn mark is. What I forgot was the the beam doesn’t magically come out of the lens. It comes in from the left and bounces off a mirror. At least it would do if my hand wasn’t in the way. A few milliseconds of an unfocused beam was enough to make me think I’d got an electric shock. Until I smelt the burning flesh. Nothing too bad, but if that beam had been focused down to a point 0.1mm across it would be a different story.